Compassionate health care coordination & advocacy for adults, the aging and disabled. 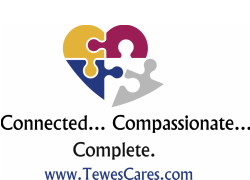 Leslie Alin Tewes is a skilled professional providing personalized, compassionate health care coordination and advocacy for adults, the aging and disabled- including those with psychiatric and developmental challenges. Read more about Leslie's credentials and experience here. Are you worried or feeling overwhelmed caring for a frail or vulnerable family member? Are you wondering if there is a way to improve quality care and life satisfaction? Do you need pertinent, unbiased information about temporary or long term care services? With Leslie, you are assured of professional services as she is a Certified Care Manager, an Aging Life Care﻿TM﻿ Advisor, Gerontologist, Geriatric & Disability Care Manager, Health Care Administrator, Medical Social Worker and Patient Advocate. Read more about Leslie's services here or use the form below to contact Leslie. Leslie's services include geriatric, aging, health care management, help with older parents, health care planning, navigate health care for the elderly and end of life care most specifically in Fairfield County, CT and the Hudson Valley Region of New York State. Leslie is headquartered in Ridgefield, CT.